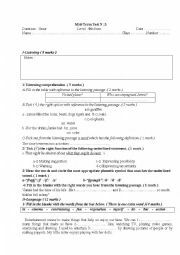 This is a mid-semester test designed for Tunisian pupils but it can be useful to other students.It contains language and writing. This is a mid-semester test N2 for the Tunisian pupils. I hope it is useful for many teachers . 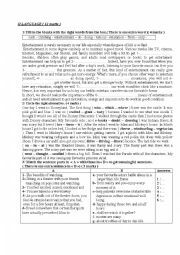 This test contains a reading passage which is a mixture of 2 themes: sharing family responsibilities and home accidents.For the language, The paragraphs are related to the following themes: education and home accidents . As for the writing, the topic deals with the generation gap problem. 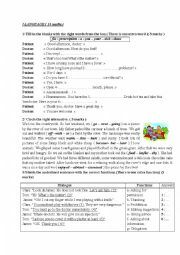 This is a test designed to meet the Tunisian English program of the 9th form level. It contains a listening passage, listening comprehension, pronunciation, spelling and language. 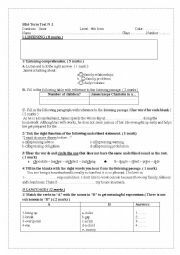 This test contains a listening about family relationships and language exercises. The tape script is included.It can be turned into an mp3 through using a text to speech converter. 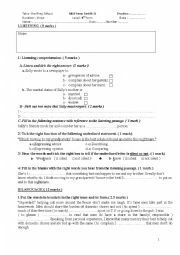 This is a mid-term test for everybody especially for Tunisian English teachers. This is a test for everyone especially for Tunisian teachers.